If you input too many incorrect passcodes on your iOS device, it’ll lock itself. But as one user found out the hard way, there’s not really an upper limit to how long that lock can last. Evan Osnos, a journalist from Washington, D.C., said he gave his three-year-old son his iPad to play with. 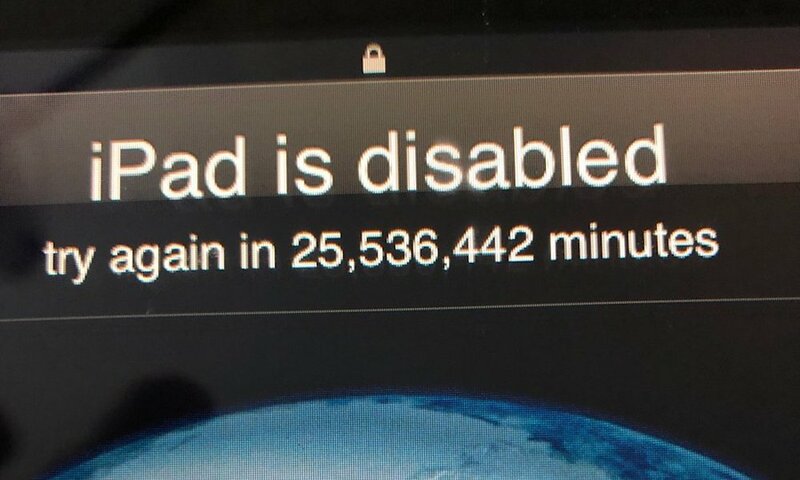 When he got the iPad back, he found that the device had been disabled for a little over 25-and-a-half million minutes. That’s roughly 47 years. That’s because the passcode-disable time limit actually increases depending on how many incorrect passcodes are typed in. Osnos took to Twitter to get a bit of advice on how to deal with the situation. Luckily, there’s a fairly easy way to unlock a device like this — but there isn’t a way to recover your data. If you haven’t backed up your device in a while, then any new data on the device will be lost. Plug your device into a Mac or PC with iTunes installed. While your device is connected, force restart it. The exact process differs depending on your iOS device. iPhone 8 and later / iPhone X and later: Press and release Volume Up, press and release Volume Down. Then, press and hold the Side button until you see the recovery screen. iPhone 7 or 7 Plus: Press and hold the Side and Volume Down buttons simultaneously. iPhone 6s and earlier, iPad with Home Button or iPod touch: Press and hold the Home and Top or Side button simultaneously. iPad with Face ID: Press and release Volume Up, press and release Volume Down. Then, press and hold the Top button until you see the recovery screen. From here, you should see an option to Restore or Update your iOS device pop up on your Mac or PC. Choose Restore and iTunes will download the latest software for your iOS device and reset it back to its factory settings. The ultimate lesson here is that you should be backing up your device regularly. And if you have small children that could lock you out of your devices for several decades, you may want to keep an eye on them while they’re playing with your iPhone or iPad.